Nearly two decades removed from his playing days, Jeff Hart in April 2009 was giving his time to help younger athletes. "It's not all about winning or losing here," Hart told The Log Cabin Democrat of Conway, Ark., "it's about just having a good time and connecting with other athletes." The younger athletes were Special Olympics athletes, a cause to which Hart has frequently lent his services to in recent years in his hometown of Greenbrier, Ark, according to articles in The Cabin Democrat. Hart's own career as a player was a brief one, lasting just three seasons in the minors. But the hurler did come out a winner 15 times in work as both a starter and a reliever. 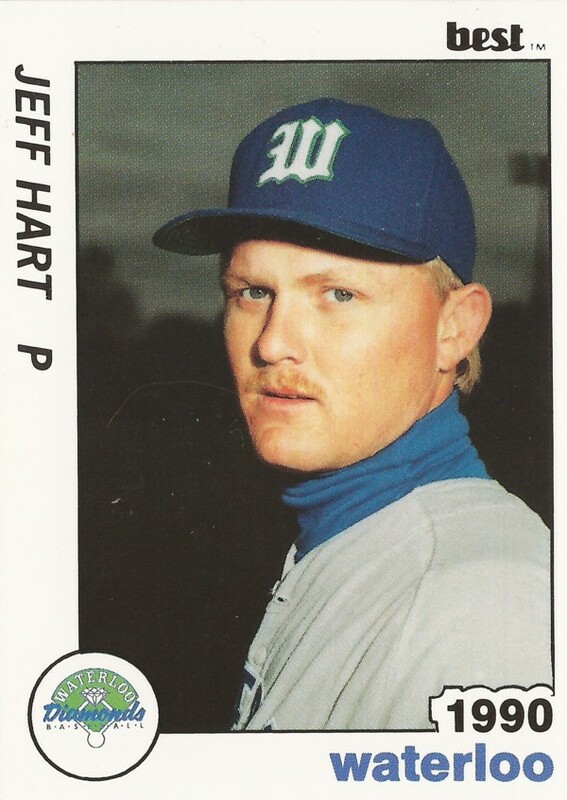 One night in 1988, Hart was most certainly a winner, throwing a no-hitter in the Arizona Rookie League. Hart's professional career began in 1988, taken by the Padres in the 42nd round of the draft out of the University of Central Arkansas. Hart started at short-season Spokane, getting into one game there, giving up two earned runs in 2.2 innings. Moved back to the Arizona Rookie League, though, Hart did better. He went 5-0 in eight starts, posting an ERA of 2.07. It was on July 18 that Hart pitched to just three batters over the minimum, giving up no hits against the visiting rookie Brewers. He gave up one walk, hit another batter and one batter reached on a error, The Associated Press wrote. Hart moved to single-A for 1989, playing largely at Waterloo. There, he served as both a starter and a reliever, going 7-7, with a 3.27 ERA. He also got four outings at single-A Charleston, giving up nine earned runs in just seven innings of work. For 1990, Hart returned to Waterloo, getting into a total of 46 games in relief. His ERA was a good 2.63 and he picked up five saves, but it wasn't enough to keep his career going. For the 42nd rounder, it was his final season. Hart went on to coach baseball at the University of Ozarks, The Log Cabin Democrat wrote. By 2001, though, he had returned home to Greenbrier, helping out with his family's catering business. Hart has since signed on with his old school district in Greenbrier, helping raise money for Special Olympics in the annual Polar Bear Plunge. In the 2008 Polar Bear Plunge, Hart won the award for best costume. More importantly, he raised the most money by an individual. He's also done his share of coaching. In 2003, he was credited by Greenbrier state All-Star Brian Robinson with keeping him in shape, The Log Cabin Democrat wrote. "He made sure we ran plenty and that we were in the right shape all year long," Robinson told The Log Cabin Democrat of Hart. "I think it helped me quite a bit."